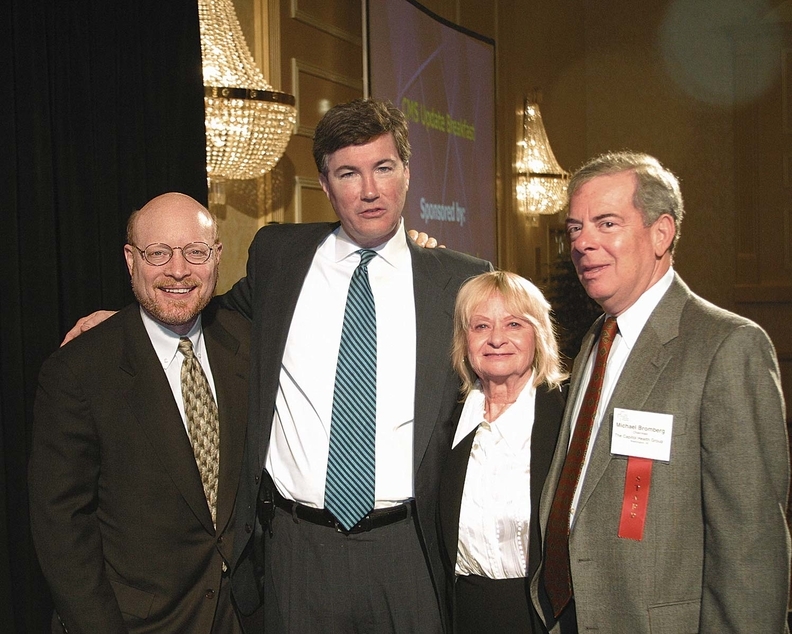 From left, Chip Kahn, Tom Scully, longtime FAH board member Sylvia Ulrich and Mike Bromberg at the federation's 40th anniversary in 2006. During the 1970s and '80s, Mike Bromberg, then head of the Federation of American Hospitals, debated New England Journal of Medicine editor Dr. Arnold Relman nearly 30 times on the issue of for-profit hospitals' right to exist. That question now is firmly settled. Fifty years after it was founded—mostly by physician-owned hospital leaders who wanted a say in how the new Medicare program paid their facilities—the federation and the for-profit hospitals it represents have established themselves as respected members in the nation's healthcare system and an influential healthcare lobbying force in Washington. Chip Kahn, the CEO since 2001, boasts that his organization spearheaded a quality-of-care initiative that led to formation of the National Quality Forum. He also touts the federation's work with the American Hospital Association and the Catholic Health Association to support passage of the Affordable Care Act. “Chip played an extraordinarily effective role helping us bring together many key healthcare stakeholders with diverse points of view to promote meaningful expansion of coverage for tens of millions of people,” said Ron Pollack, executive director of Families USA, a key leader in the push to pass the ACA. “The federation historically has done a very good job representing investor-owned hospitals and improving relationships with nonprofit colleagues through collaboration with the AHA,” said Milton Johnson, chairman and CEO of HCA, the largest of the federation's 12 member companies. He noted that last year, HCA's chief medical officer, Dr. Jonathan Perlin, became the first for-profit hospital executive to serve as AHA board chairman. Kahn said the federation will have its hands full after the November elections protecting and improving the ACA's coverage expansions. “One would have hoped it would have been a settled issue by now,” he said.